The Kaias family, the developer behind Opera in South Brisbane has submitted a development application to build ‘Mobo’, a 12-storey subtropical designed commercial building on the corner of Merivale and Tribune Streets, South Brisbane. 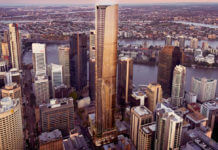 Designed by BVN, the application describes a building that embodies the core principals set out by the Brisbane City Council’s ‘Buildings that Breathe’ guidelines. If approved, Mobo would become one of the most advanced buildings of its kind when it comes to next-generation subtropical design. Located on a large 2,670 sqm site, the proposed tower has a NLA (net lettable area) of 1,550 sqm and includes integrated landscaped balconies, high-performance sun-shading and a rooftop landscaped deck and pool, said to become a ‘Green Oasis’ which will occupy 70% of available rooftop space. 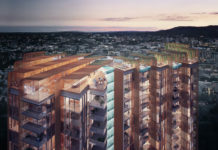 The rooftop pool deck, which is now a must-have feature of most new residential buildings in Brisbane would be the first of its kind, of this scale, for a commercial building in the South East Queensland region and illustrates the evolving trend of rooftop utilisation beyond new residential buildings. References to the classic ‘Queenslander’ has been used for the Tribune Street rooftop side. A beacon which is emblematic of weatherboard cladding would become a night time feature for the building’s proposed rooftop crown. The BCC’s Building’s that Breathe design guide details a rather unexplored idea, known as ‘City Rooms’. Within the lower levels of a building, permeable to the ground plane, the guidelines stipulate the need for strategically located semi-outdoor subtropical public spaces where people can meet for work, lunch and to relax. Through landscape design firm agla, Mobo proposes double height ground floor spaces for improved visibility into a cafe and lobby area as well as a new City Room located in the prominent street corner location. Mobo’s publically accessible City Room has been designed as a stepped down amphitheatre featuring views of the adjacent Tribune St park as well as the eastern morning sun. Mobo also seeks to promote a relationship to the adjacent Tribune St park by mimicking the Jacarandas and Fig Trees via the use of featured purple glass which will help separate the appearance of the podium levels from the tower levels. 17,000 sqm of A Grade 5 star GBCA rated Office NLA featuring large floor plates and side core to the Western elevation. 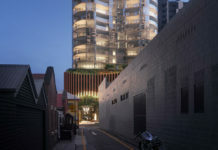 Separated podium and tower – creating a distinct podium “Street Building”, enhanced light ingress via integrated light shelf and landscape to the Podium façades. 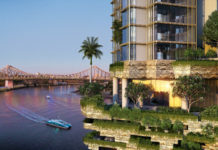 Ventilated façade zones with occupiable balconies and roof garden – “The Green Oasis”, to enhance the South Brisbane skyline with “A Living Green Building”. Two ground floor cafes as well as open public realm areas addressing the public park on Tribune St to support tenant wellness and promote a connection between the tenants and the local community. Significant integrated landscaped areas at both street, elevated ‘podium’ and roof levels. Mobo is currently in the market with CBRE’s Mel Pikos and James Comino the exclusive leasing agents involved.  The development application number for this development is A004803375. The Mobo proposal is the first subtropical designed commercial tower that truly blends elements of a residential tower proposal. End tenant users will be able to enjoy almost the same amenity as they would if they lived in a new residential building. The building is packed with innovative ideas like the amphitheatre City Room, coloured glazing and also utilises a good level of green technology. The fact the developer has gone to the length of naming this commercial development 'Mobo' as opposed to simply the building address (the norm) shows beyond normal creative thinking, and could spark a trend in commercial building marketing.